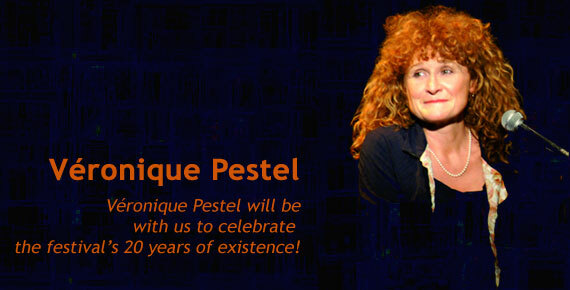 Pianist and singer-songwriter, Véronique Pestel has been touring all over France, Europe and overseas for over 20 years. Véronique Pestel's oeuvre bears a strange resemblance to a sort of alchemy that goes back to time immemorial yet remains ever-fresh and new. A cross between science and art, poetry and music, Véronique Pestel performs a powerful work of transforming her base materials by combining them: the poems she writes, the music she composes, the voice she sings with, the instruments she accompanies herself with - piano or guitar - the artists that express themselves alongside her, and the stages where she meets the people she is performing for and who come to see and hear her. Alchemy of the texts she writes, a poetic material composed of words and lyrics that she chisels, guided by her thoughts, feelings, emotions and combats, by her resistance, by what she reads, by her understanding of a self indivisible from others - living, dead or as-yet unborn: "yet not completely forgetting her life is owed to those who come /to those who stayed" (Au fil des autres, 2005); all the while facing down the weight and the fear of words, or "words that speak the worst" with the same bravery as "other's words" (1992) that are the basis of her path. Alchemy of the music she composes to bring out the meaning of the poems with melodies and rhythms appropriate to the ideas transcribed. Her music that articulates, in both her own memory and ours, the time of a human existence "Vanina" (1992) stretching across the century, or honoring the « la Messia du siècle noir », "the woman Messiah of the black century" "forever Barbara ," "Gribouille of suffereing,", and other friends, but also the unknown, the lost, "those who are quiet, who doubt, those who follow their own path, like Mimi of Saint Julien" (2000). Alchemy, finally, of the human voice: for it is indeed her voice - and Véronique Pestel herself - that transmits the alchemy of her songs, especially when we can see her and hear her on stage, alone, with or without instruments, with or without other musicians. She explicitly expresses, in one of her recent songs, the essential lineage of this alchemy that holds thanks to, and with, the connections she is able to establish between her life and "the thread of others". Age four: can write, plink on the piano, sing. Age six: primary school, music school and dance class. 70s: arts and music high school, followed by a degree in philosophy at the University of Paris. 1983: First tape, "Chansons sur choses à dire"